Mon., 3 Jun. - Thu., 6 Jun. Fri., 19 Jul. - Mon., 22 Jul. So there you are, waiting in the checkout line of the convenience store. You’re scanning the small chocolate display, wondering if you should grab a Cadbury Cherry Ripe or a Nestlé Golden Rough…or maybe even both. And then something on the greeting card rack catches your eye. 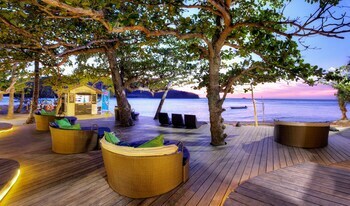 It’s a postcard with a picture of an undisturbed, palm tree-lined beach, “Welcome to Fiji” emblazoned across the top. The thought, “I need to go there immediately” enters your mind. Luckily for you, we here at Wotif have unbelievable offers on holiday packages to Fiji, and we think it’s about time you take advantage of them. Don’t wait for your boss to slap a last-minute assignment on you—get away while you still can. If you were looking to go to a place where daily life revolves almost exclusively in, on and around the sea, then the Fijian archipelago is the spot for you. Want to explore the depths of the ocean in search of Nemo? Some of the best diving companies in the South Pacific are located here. Feel like locking in some solid tube time? One of the world’s top surfing spots is located a kilometre-and-a-half away from a heart-shaped island. Diveaway Fiji – Located on the Coral Coast of the main island of Viti Levu, this dive company is the only PADI (Professional Association of Diving Instructors) 5-star rated of its kind in the country. The dive masters will teach you everything you need to know about the world of scuba. Once you get through the preliminary pool courses, you’ll be ready for the adventure of a lifetime under the sea. Moray eels, black tip reef sharks, clown fish, green sea turtles and many other creatures of the deep will be waiting for you. 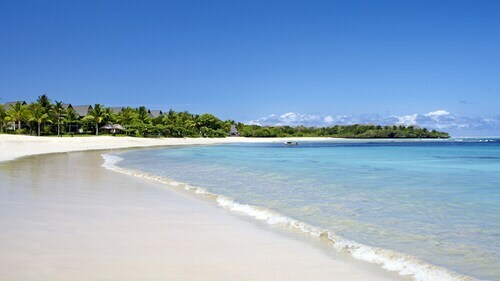 Tavarua Island – Are you looking for a private luxury resort with a side of perfect waves? 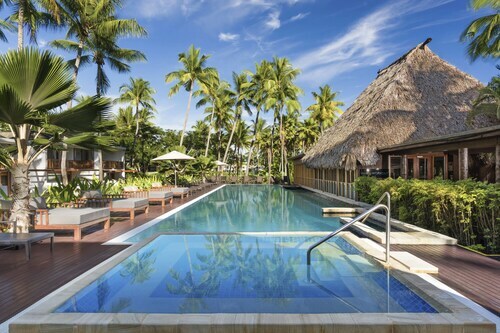 Just make your way to the island resort of Tavarua and you’ll find it. This place is so exclusive they only allow around 15-20 guests on the island at one time, and the perfect waves of Cloudbreak and Restaurants (both prime surf spots) thunder just offshore. The best part, though, is that upon arrival you’ll be treated to a kava ceremony. Just be careful not to drink too much or else your teeth will go numb. Captain Cook Cruise – What’s better than a sunset dinner cruise to close out a great day? Nothing except a cold cocktail to go along with a plate of fresh-caught seared tuna belly. If you’re not into raw seafood, there are all sorts of other options, like fresh salads, grilled steaks and an array of local fruit. Hold that drink up high and toast to an epic Fiji holiday. Do you smell that? It’s the smell of victory. Why victory? Because you’re about to book one of Wotif’s insane Fiji holiday packages and have the time of your life. 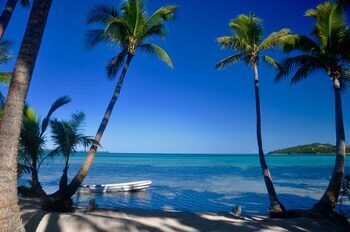 And be sure to reserve one of our smashing Fiji car hire deals so you’ll be able to cruise the coastal roads in style. Plan, book, pack and go. It’s that easy, kids. Need insider tips on must-see attractions in Fiji? Check out our Fiji travel guide! If you're looking for a lively, multicultural destination in Fiji, Nadi is the place. Situated on the western coastline of Viti Levu, Nadi is the largest of Fiji's more than 300 islands. The primary port of entry is Nadi International Airport (NAN), just 9 km north of town. Once you arrive, you’ll find the main street, Queens Road—nope, no apostrophe—bustling with activity as Fijian music emanates from storefronts and homes. Ready to spend your days loafing around in flip-flops and board shorts? We’re pretty sure you are—after all, the tropics are no place for shirts. Curious? Beachcomber Island package deals let you experience everything that’s right about a dreamy holiday… minus the maxing out of your credit card. This picturesque sanctuary, located at the centre of the Mamanuca Islands, is surrounded by warm turquoise water and has all the coconuts you could hope for. The South Pacific is no stranger to scenic vistas, but even by its standards, Mana Island, Fiji, is special. One of approximately 20 islands that make up the Mamanuca Islands, Mana is located west of the Coral Coast and is loaded with everything great about this part of the world: pristine beaches, palm trees and clear water. With a range of activities that include kayaking and wildlife sightings, Mana Island holidays have a little something for everyone. Suva is the biggest city in the South Pacific, loaded with eclectic flavour and all the tropical beauty Fiji is renowned for. It’s a popular destination for visitors who want warm, beautiful surroundings and a friendly community to explore. Whether your holiday in Suva is about relaxation, adventure or both, you'll find plenty of ways to explore land and sea while you're here. Savusavu is a Fijian community located along the southern coast of the island of Vanua Levu. 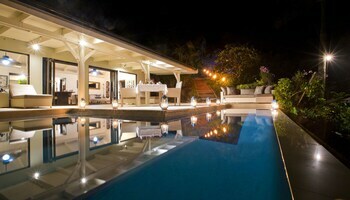 Here, you'll enjoy a leisurely pace enhanced by the warm hospitality of the island's residents. Savusavu packages put you in proximity to many natural wonders, including rainforests, beaches and underwater seascapes, so make sure you bring a waterproof camera to snap a picture of yourself with the local sea life. Just because there’s so much to see and do, doesn’t mean you need to be constantly out and about; it’s perfectly OK to do nothing at all in Savusavu. Relax in a hammock with a mug of Fiji Bitter or a glass of soothing Kava. Choose whatever suits your holiday self best. The lush, rugged features of Fiji's Taveuni Island, one of the country's largest, make it an attractive destination for nature lovers and those looking to visit a rich landscape. 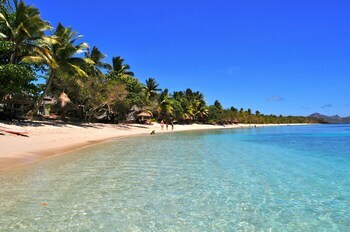 Known as Fiji's Garden Island, Taveuni spreads over more than 440 square km, but is home to just eight small villages. Most of the island is a natural wonder, loaded with waterfalls tucked away into lush rainforests. 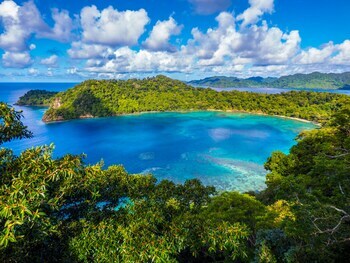 From tropical fishing to diving and hiking, you can really take a walk on the wild side in this ecological hot spot, which feels like a remote jungle that’s still loaded with all the amenities you’d want on a holiday. What would you do if you owned an island? Would you turn it into a paradise for tropical holidays? Well, that’s exactly what happened with Turtle Island. 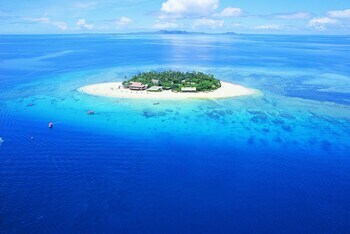 This gorgeous little isle is part of an archipelago in Fiji. Secluded and quiet, it’s the perfect place to take that special someone. Or pretend you’re Tom Hanks in Castaway. Whatever blows your hair back. Sure, Lautoka is probably better known for sugar production than tourism, but this Fijian city of 50,000 makes a great base camp for adventures elsewhere in the island group. Located only 25 km from Nadi International Airport, Lautoka is flanked by Mt. Koroyanitu and filled with street markets, gorgeous scenery and yes, warm tropical seas. Hear that sound? 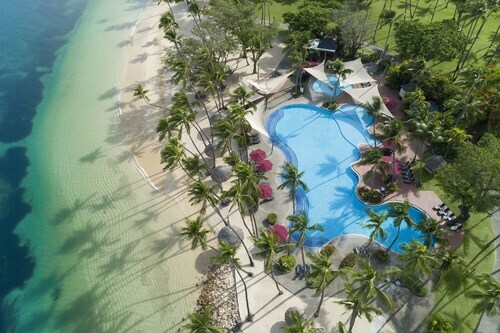 It’s your holiday self telling you to book Lautoka packages already. 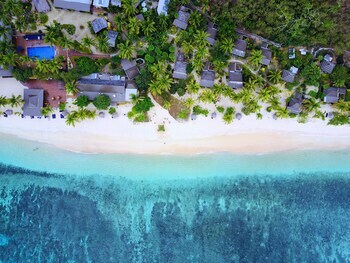 With long-trunked palm trees angling over turquoise waters and white sand wrapping around the base of rugged mountains, it's no wonder travellers are flying and floating their way to the South Pacific with Kadavu Island holiday packages. On this volcanic island in the southern part of the Fijian archipelago, there are relaxing diversions aplenty for business professionals, families and travellers looking for a relaxing escape. The largest of Fiji's islands, Viti Levu is full of surprises. Home to the busy capital of Suva, a Viti Levu holiday has a bit of everything. On this South Pacific island, you’ll be free to go with the flow—plan an adventurous day trip, relax on a pristine beach or taste incredible seafood on your island holiday. 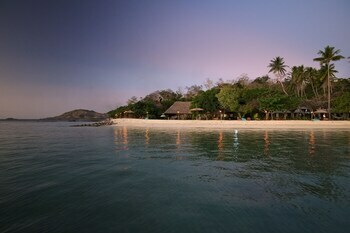 Treasure Island, Fiji, is a resort island located in the Mamanuca group of islands in the South Pacific. It's one of the world's most sought-after destinations and the ideal spot for travellers looking for romance and mystery in a remote seaside location. Treasure Island holiday packages are the quickest way to relaxation—you can book your whole stay at once, whether you're planning to go for a few days or a couple of weeks. You'll love the beauty and relaxation you find among the tropical breezes, and chances are you won't ever want to leave. 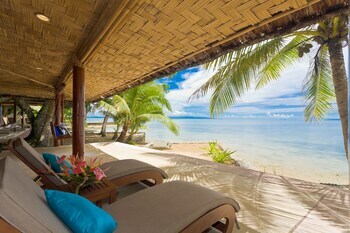 Picture a private resort on Castaway Island (also known as Qalito), one of Fiji's beautiful Mamanuca Islands. Just a short 20 km trip from Nadi International Airport (NAN), travellers can view the small cluster of Mamanuca Islands before landing and settling in to a resort with everything you need for a perfect stay. While on Castaway Island holidays you can disconnect from the rest of the world and live it up…or relish a little gosh-darn peace and quiet. In this constantly plugged-in era, true escapes might seem more elusive than ever. Unspoiled beaches, blue lagoons and wild-growing orchids might seem like the stuff of fantasy, but a holiday in Malolo Lailai will make you one with nature. Surrounded by soft ocean waves, a mellow pace and the swish of palm trees, it's impossible to fight the relaxed vibe of Vanua Levu. Yes, we said impossible, so really, just embrace it. Less frequented than Viti Levu, Fiji's second-largest island is a laid-back getaway. Adventure and relaxation await you with Vanua Levu packages, complete with underwater escapades and rejuvenating beaches. You need something new in your life—say, something hot. Maybe even something steaming. 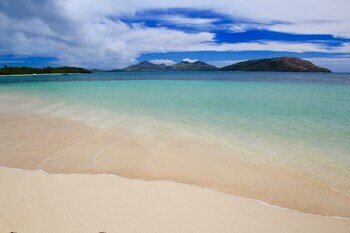 Well you’re in luck; Yasawa is made up of several volcanic islands and small islets. Spread out over 80 km of beautiful ocean, this group is covered with mountains ranging in height from 250 to 600 metres. If your idea of a great holiday in the Yasawa Islands includes some hiking, then you’ll be in heaven. Great Resort, friendly staff, great duty managers round the clock, lots of activities for kids and families. Our 7 days went beautifully well. Very happy !